You can create PDF files out of the current displayed file, or all the files that are loaded in the player window. Use the Source File option to specify whether you with to create a PDF with just the current displayed file (default option), or with all the files loaded in the player window. Select the page/paper size you wish for the output PDF. Smaller page size may lead to smaller final file size. The title to set in PDF file metadata. No default value will be set in the output file if not specified. The creator to set in PDF file metadata. The default value will be the Qt version used to build this application. Relevant only when creating a PDF with all the files loaded in the player window. Indicates whether the file name should be sorted in alphabetical order to generate the output PDF. The default file listing has no deterministic order if generated from a directory or directories. If you have dragged and dropped individual files in the desired order into the player window, then you should not let the application sort the files (uncheck the checkbox), and it will honour the order you specified. 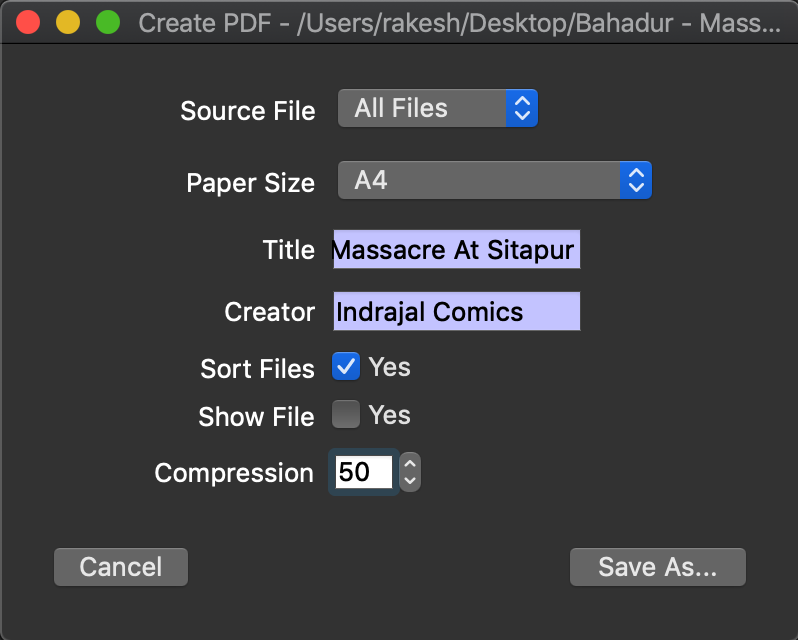 Check the Show File check-box to display the generated PDF file in the native file manager for your platform (Finder on Mac OS X, and Explorer on Windows). JPEG compression to apply to the scaled image before drawing on the output PDF page(s). The default of 100 will use no compression. You can experiment with various values and balance output file size vs quality of the output. Note: Enabling compression slows down the PDF generation process.